The New Chevrolet Equinox is the compact crossover SUV that you can count on to get you there, whether you’re commuting from Waukegan or hitting the Arlington Height’s Racetrack on the weekend. The Equinox also won the JD Power Most Dependable Compact SUV based on a survey of 2015 models and was ranked #9 by US News. View our Chevy Equinox inventory and then stop by Libertyville Chevrolet near Gurnee for a test drive. Gray Metallic 2019 Chevrolet Equinox LT 1LT FWD 6-Speed Automatic 1.5L DOHC 120-Volt Power Outlet, 2 USB Data Ports, 2 USB Data Ports w/SD Card Reader, 3-Spoke Leather-Wrapped Steering Wheel, Black Surround Grille (LPO), Blackout Package (LPO), Confidence & Convenience Package, Driver Confidence Package, Driver Convenience Package, Dual Zone Automatic Climate Control, Front & Rear Black Bowtie Emblems (LPO), Gloss Black Emblem Kit (LPO), HD Rear Vision Camera, Heated Driver & Front Passenger Seats, Infotainment Package, Lane Change Alert w/Side Blind Zone Alert, Leather-Wrapped Shift Lever, Mosaic Black Mirror Caps (LPO), Outside Heated Power-Adjustable Mirrors, Preferred Equipment Group 1LT, Radio: Chevrolet Infotainment 3 Plus System w/Navi, Rear Cross Traffic Alert, Rear Park Assist w/Audible Warning, Rear Power Liftgate, Remote Vehicle Starter System, Universal Home Remote. All prices include all available Incentives. Price is valid for 24 hours. Tax, title, license, doc fee extra. While we try to ensure online merchandising accuracy;dealer not responsible for website errors. Please call to verify price. Recent Arrival! 26/32 City/Highway MPG Pricing includes all available rebates, dealer is not responsible for any pricing errors. Please call for pricing and availability. Gray Metallic 2019 Chevrolet Equinox Premier FWD 6-Speed Automatic 1.5L DOHC 2 Rear USB Charging-Only Ports, 2 USB Data Ports, 2 USB Data Ports w/SD Card Reader, 8-Way Power Front Passenger Seat Adjuster, Adaptive Cruise Control - Camera, Bluetooth® For Phone, Bose Premium 7-Speaker Audio System Feature, Confidence & Convenience II Package, Driver Confidence II Package, Driver Convenience II Package, Following Distance Indicator, Forward Collision Alert, Front Pedestrian Braking, HD Radio, HD Surround Vision, Heated Rear Seats, Heated Steering Wheel, Infotainment II Package, IntelliBeam Auto High Beam Headlamp Control, Lane Keep Assist w/Lane Departure Warning, Low Speed Forward Automatic Braking, Preferred Equipment Group 1LZ, Radio: Chevrolet Infotainment 3 Premium System, Safety Alert Seat, SiriusXM Radio, Ventilated Driver Seat, Ventilated Front Passenger Seat. All prices include all available Incentives. Price is valid for 24 hours. Tax, title, license, doc fee extra. While we try to ensure online merchandising accuracy;dealer not responsible for website errors. Please call to verify price. 26/32 City/Highway MPG Pricing includes all available rebates, dealer is not responsible for any pricing errors. Please call for pricing and availability. Black Metallic 2019 Chevrolet Equinox Premier AWD 6-Speed Automatic 1.5L DOHC 2 Rear USB Charging-Only Ports, 2 USB Data Ports, 2 USB Data Ports w/SD Card Reader, 8-Way Power Front Passenger Seat Adjuster, Adaptive Cruise Control - Camera, Bluetooth® For Phone, Bose Premium 7-Speaker Audio System Feature, Confidence & Convenience II Package, Driver Confidence II Package, Driver Convenience II Package, Following Distance Indicator, Forward Collision Alert, Front Pedestrian Braking, HD Radio, HD Surround Vision, Heated Rear Seats, Heated Steering Wheel, Infotainment II Package, IntelliBeam Auto High Beam Headlamp Control, Lane Keep Assist w/Lane Departure Warning, Low Speed Forward Automatic Braking, Preferred Equipment Group 1LZ, Radio: Chevrolet Infotainment 3 Premium System, Safety Alert Seat, SiriusXM Radio, Ventilated Driver Seat, Ventilated Front Passenger Seat. All prices include all available Incentives. Price is valid for 24 hours. Tax, title, license, doc fee extra. While we try to ensure online merchandising accuracy;dealer not responsible for website errors. Please call to verify price. 25/30 City/Highway MPG Pricing includes all available rebates, dealer is not responsible for any pricing errors. Please call for pricing and availability. Red Tintcoat 2018 Chevrolet Equinox LT 2LT AWD 9-Speed Automatic 2.0L Turbocharged All prices include all available Incentives. Price is valid for 24 hours. Tax, title, license, doc fee extra. While we try to ensure online merchandising accuracy;dealer not responsible for website errors. Please call to verify price. 22/28 City/Highway MPG Pricing includes all available rebates, dealer is not responsible for any pricing errors. Please call for pricing and availability. Black Metallic 2019 Chevrolet Equinox Premier AWD 9-Speed Automatic 2.0L Turbocharged 2 Rear USB Charging-Only Ports, 2 USB Data Ports, 2 USB Data Ports w/SD Card Reader, 4-Wheel Antilock 4-Wheel Disc Brakes, 8-Way Power Front Passenger Seat Adjuster, Adaptive Cruise Control - Camera, Bluetooth® For Phone, Body-Color Trailer Hitch Close-Out Cover, Bose Premium 7-Speaker Audio System Feature, Confidence & Convenience II Package, Driver Confidence II Package, Driver Convenience II Package, Dual Stainless-Steel Exhaust w/Bright Tips, Factory Installed Trailer Hitch, Following Distance Indicator, Forward Collision Alert, Front Pedestrian Braking, HD Radio, HD Surround Vision, Heated Rear Seats, Heated Steering Wheel, Infotainment II Package, IntelliBeam Auto High Beam Headlamp Control, Lane Keep Assist w/Lane Departure Warning, Low Speed Forward Automatic Braking, Preferred Equipment Group 2LZ, Radio: Chevrolet Infotainment 3 Premium System, Safety Alert Seat, SiriusXM Radio, Trailering Equipment, Ventilated Driver Seat, Ventilated Front Passenger Seat. All prices include all available Incentives. Price is valid for 24 hours. Tax, title, license, doc fee extra. While we try to ensure online merchandising accuracy;dealer not responsible for website errors. Please call to verify price. 22/28 City/Highway MPG Pricing includes all available rebates, dealer is not responsible for any pricing errors. Please call for pricing and availability. Pearl 2019 Chevrolet Equinox Premier AWD 9-Speed Automatic 2.0L Turbocharged 2 Rear USB Charging-Only Ports, 2 USB Data Ports, 2 USB Data Ports w/SD Card Reader, 4-Wheel Antilock 4-Wheel Disc Brakes, 8-Way Power Front Passenger Seat Adjuster, Adaptive Cruise Control - Camera, Bluetooth® For Phone, Body-Color Trailer Hitch Close-Out Cover, Bose Premium 7-Speaker Audio System Feature, Confidence & Convenience II Package, Driver Confidence II Package, Driver Convenience II Package, Dual Stainless-Steel Exhaust w/Bright Tips, Factory Installed Trailer Hitch, Following Distance Indicator, Forward Collision Alert, Front Pedestrian Braking, HD Radio, HD Surround Vision, Heated Rear Seats, Heated Steering Wheel, Infotainment II Package, IntelliBeam Auto High Beam Headlamp Control, Lane Keep Assist w/Lane Departure Warning, Low Speed Forward Automatic Braking, Preferred Equipment Group 2LZ, Radio: Chevrolet Infotainment 3 Premium System, Safety Alert Seat, SiriusXM Radio, Trailering Equipment, Ventilated Driver Seat, Ventilated Front Passenger Seat. All prices include all available Incentives. Price is valid for 24 hours. Tax, title, license, doc fee extra. While we try to ensure online merchandising accuracy;dealer not responsible for website errors. Please call to verify price. 22/28 City/Highway MPG Pricing includes all available rebates, dealer is not responsible for any pricing errors. Please call for pricing and availability. Pearl 2019 Chevrolet Equinox Premier AWD 9-Speed Automatic with Overdrive 2.0L Turbocharged 8-Way Power Front Passenger Seat Adjuster, Adaptive Cruise Control - Camera, Confidence & Convenience II Package, Driver Confidence II Package, Driver Convenience II Package, Following Distance Indicator, Forward Collision Alert, Front Pedestrian Braking, HD Surround Vision, Heated Rear Seats, Heated Steering Wheel, IntelliBeam Auto High Beam Headlamp Control, Lane Keep Assist w/Lane Departure Warning, Low Speed Forward Automatic Braking, Safety Alert Seat, Trailering Equipment, Ventilated Driver Seat, Ventilated Front Passenger Seat. All prices include all available Incentives. Price is valid for 24 hours. Tax, title, license, doc fee extra. While we try to ensure online merchandising accuracy;dealer not responsible for website errors. Please call to verify price. 22/28 City/Highway MPG Pricing includes all available rebates, dealer is not responsible for any pricing errors. Please call for pricing and availability. Black Metallic 2018 Chevrolet Equinox Premier AWD 9-Speed Automatic 2.0L Turbocharged All prices include all available Incentives. Price is valid for 24 hours. Tax, title, license, doc fee extra. While we try to ensure online merchandising accuracy;dealer not responsible for website errors. Please call to verify price. 22/28 City/Highway MPG Pricing includes all available rebates, dealer is not responsible for any pricing errors. Please call for pricing and availability. 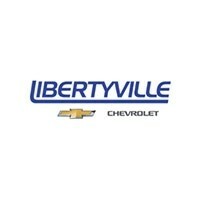 Apply for financing or contact us at Libertyville Chevrolet with your additional car buying questions.